You The Biscuit: Pop up design creation. 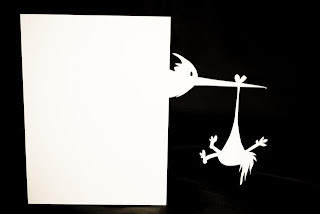 I wanted to create a pop up card for my bother & sister in-law for the arrival of there new daughter. I played around with cheesy teddy bears and rabbits, until I thought a bit deeper of what had just happened and how the baby arrives... we all know dont we?